Australia - War years: 1939-1957. 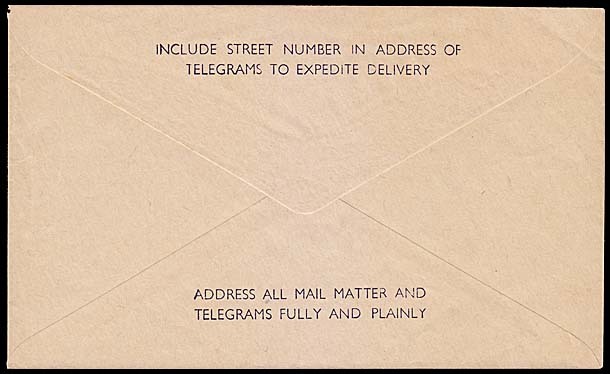 Ordinary rate delivery envelopes: AW-EO-14. Heading and notes: Form number T.G. 65B. 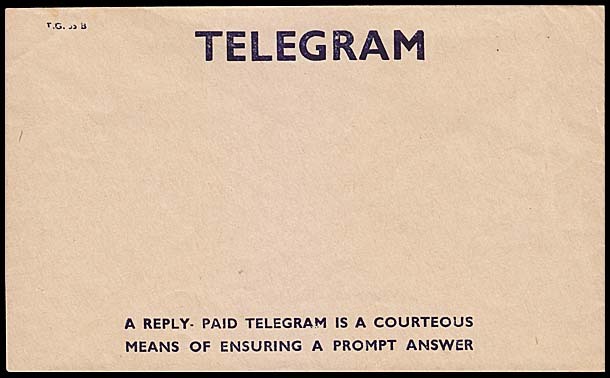 TELEGRAM is centered at the top of the envelope (sans-serif letters). Reverse side: Two standard slogans. Colours (text & envelope): Very dark blue on drab brown. Size of envelope overall: 78 × 135 mm. printed with four different flap designs. 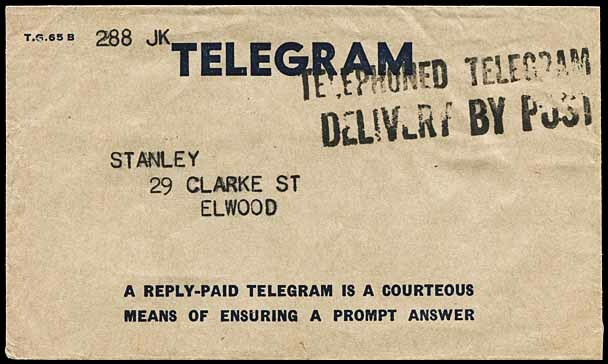 The printing of Australian delivery envelope type EO-14 took place from 1946 (exact detail not known). 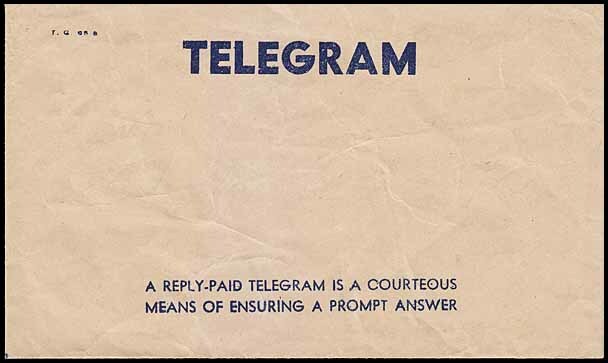 The major change which occurred at this time was the replacement of the war-related slogans with three "ordinary life" slogans related to Reply-Paid Telegrams and addressing/posting postal items and telegrams. 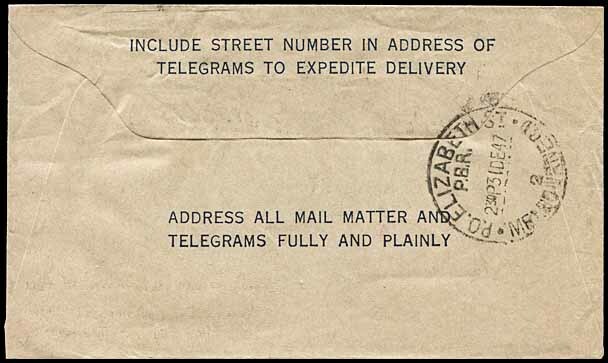 These slogans were standard for the 10 years in which this type of envelope was printed. "14. 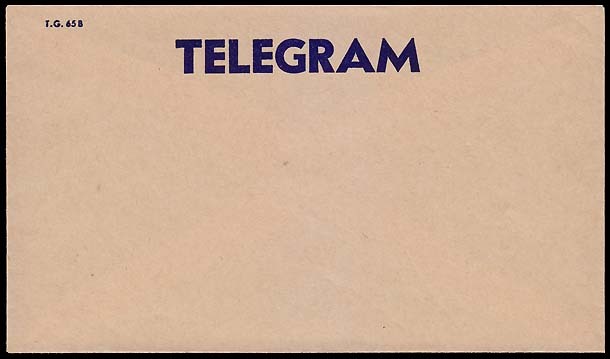 Supplies of Telegram Envelopes: - The position regarding the supply of telegram envelopes is still presenting many difficulties and in view of the present conditions in the paper and printing industries, it is essential that the utmost economy be exercised in the use of telegram envelopes. Postmasters and other officers concerned are therefore asked to give this matter special attention, with a view to reducing wastage in telegram envelopes to a minimum" (G.B. 46/3981). 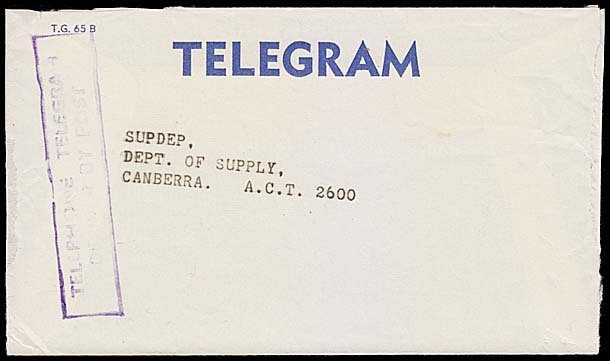 Unused opaque ordinary rate delivery envelope. This unusually large envelope is related in some way to the earlier window delivery envelope AW-EO-13. 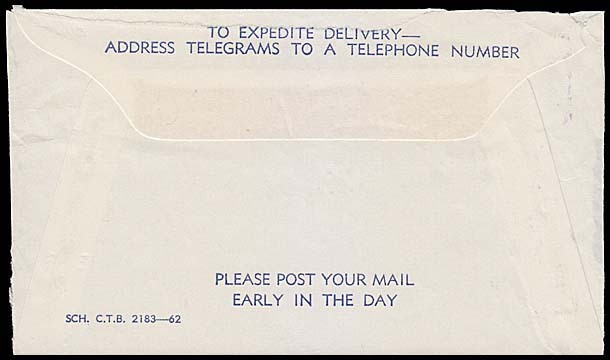 Reverse side of the above opaque delivery envelope. first line of slogan A REPLY-PAID ... is in wide letters and it spans 87 mm. 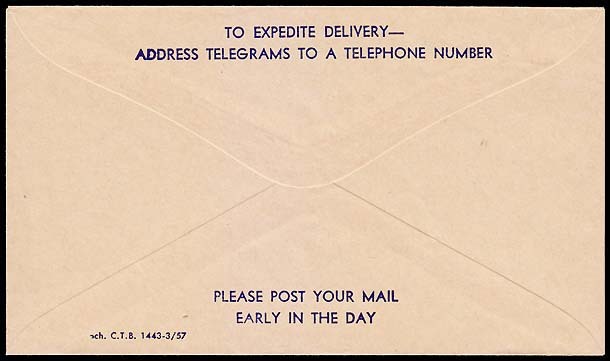 Reverse side of above opaque delivery envelope. first line of slogan A REPLY-PAID ... spans 71 mm. Is known used with LRD of 19 May 1979 at Wavell Heights, Qld (showing how stock could be pushed to the back when new stock arrived). first line of slogan A REPLY-PAID ... spans 80 mm. 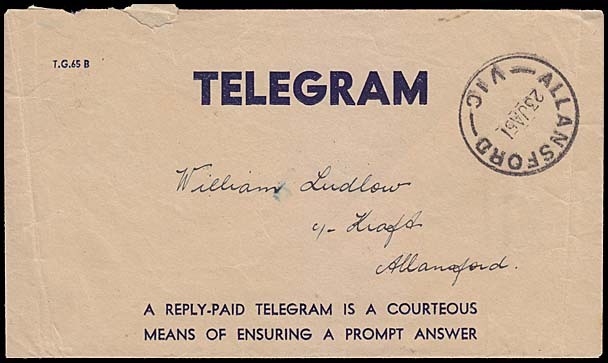 A slightly later date on an envelope with this format was used to deliver AW-DO-10 (47). 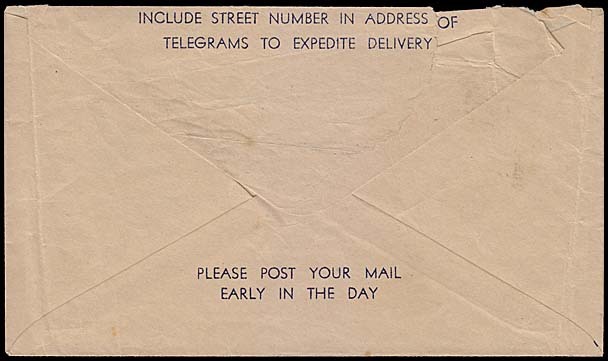 Reverse side of the above delivery envelope. Used at Allansford, Vic. 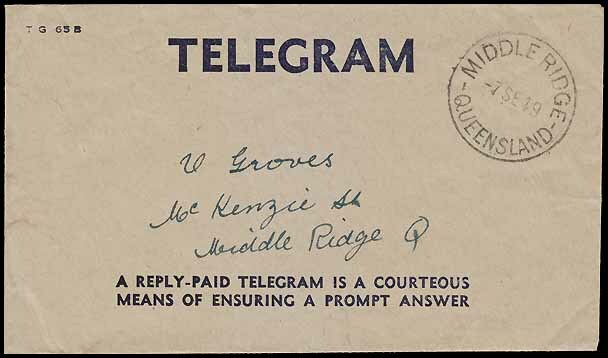 on 23 January 1951.
first line of the slogan A REPLY-PAID ... spans 76 mm. 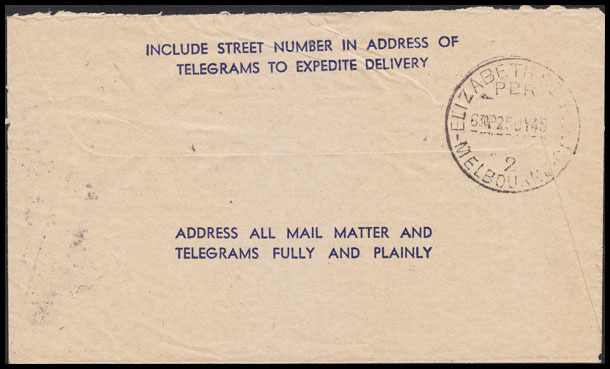 Reverse side of the above delivery envelopes - both identical. Printed in March 1957. 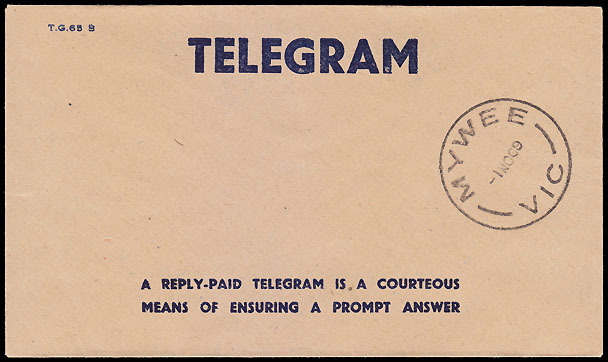 AW-EO-14G (reverse). 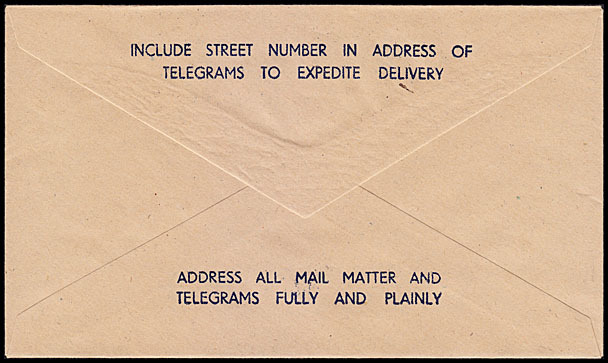 Reverse side of the above opaque ordinary rate delivery envelope. has a schedule number in the lower left corner. Opaque ordinary rate delivery envelope. Previous ordinary rate delivery envelope (AW-EO-13). 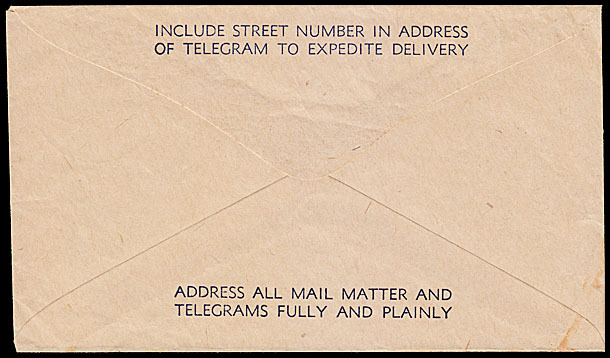 Next ordinary rate delivery envelope (AW-EO-15). 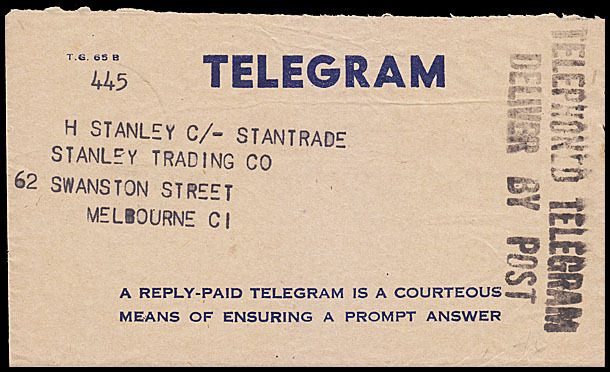 Overview page of Australian ordinary rate delivery envelopes.